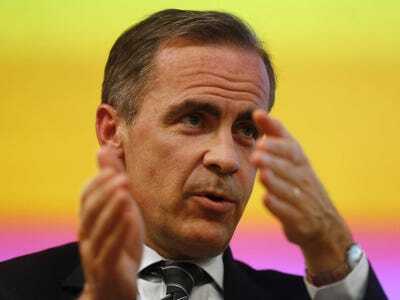 REUTERS/Sang TanBank of England Governor Mark Carney speaks to the audience after his public speech on ‘One Mission. One Bank. Promoting the good of the people of the United Kingdom’ at the Cass Business School in London March 18, 2014. The Bank of England’s latest minutes just came out. Given the pace at which spare capacity appeared to have been eroded over the past year and the possibility that productivity growth would remain weak, there was a risk that any remaining slack might soon be exhausted, causing inflationary pressures to build. The Bank of England has been fairly dovish lately: in its latest inflation report, it suggested that inflation might not come back to target in the next two years. This snippet is an interesting alternative view, that when unemployment drops further, and if productivity doesn’t rise (as the Bank thinks it will), a lot more inflationary pressure could be created. If workers become a lot more productive and efficient, that tends to keep inflation low. If they don’t, companies need more workers to produce the same amount, and that drives up wages without generating any extra output. Given the UK’s massive productivity problem, this could be a big problem for the Bank.